The quest for good governance is a long and ongoing struggle. When Colette and I were on our honeymoon in Italy we saw a lot of paintings, but it was ‘The Allegory of Good and Bad Government’ by Ambrogio Lorenzetti that impressed us the most. It is a series of six paintings depicting the effects of good and bad governance, painted for the Councillors of the republican city state of Siena in 1339. Today, as in the Fourteenth Century, ensuring peace and freedom from the fear of violence are the most basic requirements of governments. This week a historic peace deal has been signed in Columbia ending 52 years of civil war that left 260,000 people dead and six million internally displaced. Congratulations go to President Santos and to the Farc rebel leader Timoleon Jimenez, to the Columbian people and to all those who helped bring this agreement into being. President Santos said “Columbia celebrates, the planet celebrates because there is one less war in the world”. There are of course still far too many countries wracked by civil war and chaotic and sporadic violence: Syria, Yemen, Libya, Somalia, Southern Sudan, Zaire to name but a few. If ensuring peace and freedom from fear of violence is the most basic requirement of governance, what then in the highest aspiration of governance? Scandinavia has for decades led the world in good human rights, social justice and much else. Danish politicians like Ida Auken are trying to establish a circular economy to make the best use of resources, and the Danish Green Party is campaigning to end the import of fossil-fuelled cars by 2025. The Swedish coalition government of Social Democrats and Greens have created a strong economy with falling unemployment, strong economic growth, where the deficit has been eliminated and they are now introducing a system to give tax incentives to people who repair all manner of goods rather than throw them away and buy new. This should reduce the materials through-put of the economy and create more jobs. Scandinavia is pioneering so many ideas focused on ecological sustainability and social justice, and that for me is the very essence of good governance in the Twenty-first century. The Danish word hygge is sometimes translated as ‘cosiness’. It is also associated with being comfortable in ones community, with social solidarity, with being at peace and with happiness. Perhaps ensuring it is how all people feel should be the highest ambition of governments. We all have a lot to learn from Scandinavia. This entry was posted in Global, Politics on 27 September 2016 by Richard. The campaign to disinvest from fossil fuels is gaining momentum. 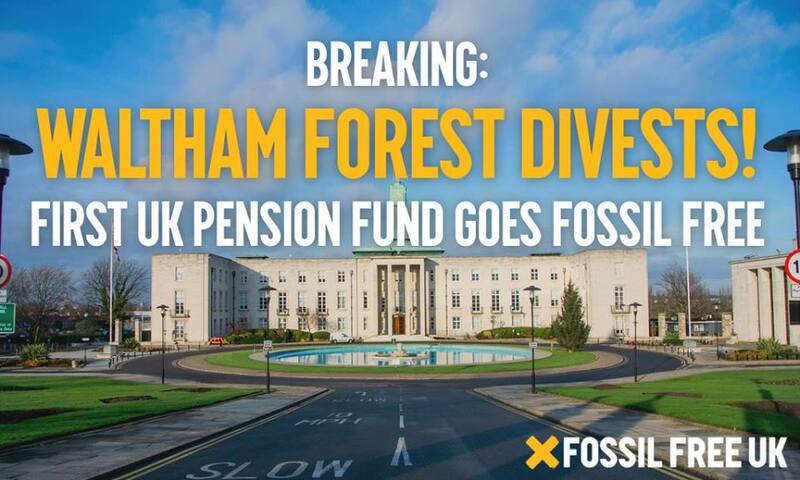 Last night Waltham Forest Council Pension Fund Committee voted to fully disinvest. They are the first UK council to do so, but it’s probable that many others will follow. In the past the main arguments were ethical, all about climate change, air pollution and trying to promote better alternatives. Renewable energy technologies, including generation, transmission and storage, are all seeing rapid increases in efficiency and decreasing costs. This will mean that many investments in fossil fuel and nuclear will become stranded assets, unable to sell the energy they generate when competing against cheaper renewables. It now makes very prudent business sense to disinvest from fossil fuels. Waltham Forest joins 600 institutions with combined assets of over $3.4 trillion in the disinvestment movement. The powerful combination of good business sense and strong ethical foundations make this a movement set for exponential growth. We’ve seen a lot of bankruptcies in the coal industry of late, oil, gas and nuclear are all likely to see casualties over the coming year or two. UN secretary general Ban Ki-Moon, speaking in the light of the Paris Climate Agreement and in relation to the transition from a fossil fuel economy to a renewables based economy said that “The once unthinkable has now become unstoppable”. This entry was posted in Business Investment, Energy on 23 September 2016 by Richard. Theresa May’s new government has given the go ahead for Hinkley C nuclear power station. This seems to me to be a deal of mind boggling stupidity. Although the deal has been signed it is far from clear if the reactor will ever work. EDF’s design has been described by technical experts as “unbuildable” and the financial situation as “madness”. Only two reactors of this type have ever been attempted and both are massively over budget, behind schedule and may never be completed due to ongoing technical faults in the reactor vessels, at both Flamanville in France and Olkiluoto in Finland. There are all manner of security and waste management issues that are far from resolved. The initial price tag of £18bn will turn into a figure far higher once the 35 year contract for buying the over-priced electricity is taken into consideration: I’ve seen figures suggesting this could push the total project price up to £24 or £37 bn. All rather fairytale figures if, as I suspect, the project may be a colossal white elephant, and may never actually generate electricity anyway. 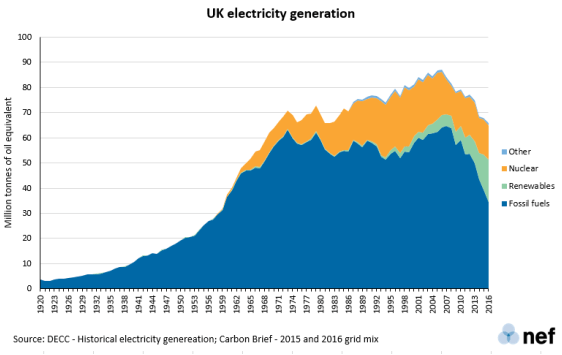 Over the last decade two very good and significant trends have emerged in UK electricity generation, as the above graph shows. One is that demand is falling quite steeply. This is due to increased efficiency. The other is the rapidly rising share of renewable energy in the mix. Both these trends could be further enhanced with intelligent government leadership, and fossil fuel use could continue to plummet at the same time as nuclear power could be gradually phased out. Hinkley C was designed for a world that no longer exists, where demand was thought to be increasing and that there was a need for large base-load power stations. What is now needed is flexible load balancing technologies to back-up the growing solar and wind power. The proposed interconnector with Norway, the proposed expansion of pumped storage hydro at Cruachan and the proposed Swansea bay Tidal Lagoon are all excellent examples that the UK should be building. There is so much more that we could be doing. One idea I’d like to see developed would be to take a city like Liverpool with high unemployment and high rates of fuel poverty and see what could be done to work out a whole city approach to improving things. One could improve the energy efficiency of every property with a coordinated insulation and draft proofing programme and connect every property in the city to a district heating system modelled on that of Copenhagen, and include a huge heat pump taking heat from the Mersey, as Drammen in Norway do from their local fjord. This would create more employment, warmer homes and other benefits for a fraction of the cost of Hinkley C.
This entry was posted in Energy, Politics on 16 September 2016 by Richard. 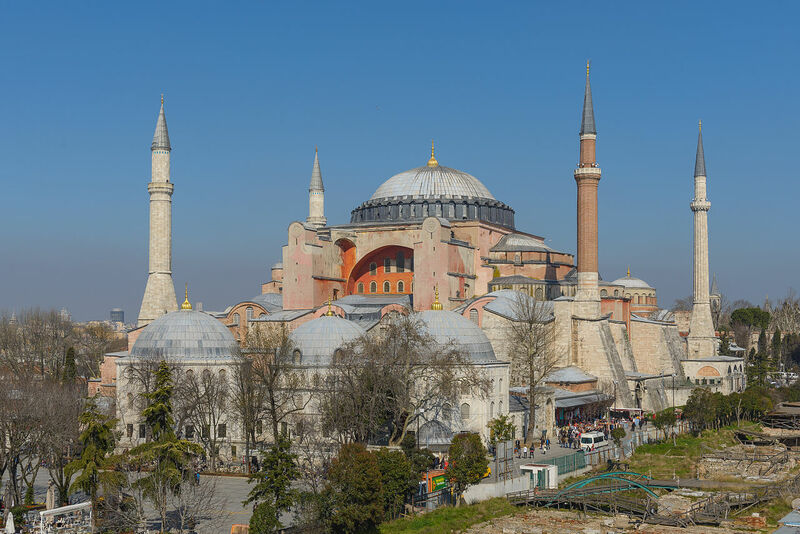 The extraordinary Hagia Sophia, built in 537 AD, for 1,000 years the world’s largest cathedral, later a mosque, now a museum. It’s been a couple of weeks since I posted a blog. We’ve been away in Turkey for a family wedding, and then a bit of sightseeing while we were there. Tragically so much of what one hears about Islam these days is in connection to terrorism. In Turkey we saw quite intimately the other side of Islam: extraordinary reaching out to create loving bonds between people, irrespective of differences across religion, language and culture. Personally I’m delighted by the growing cultural diversity within my own extended family and proud of the integrity all the individuals within it. After the wedding our sightseeing took us to the ruins of Ephesus, to Selcuk, Milas and to Istanbul. We found the Turkish people very warm and welcoming, and very keen for tourists to come. Given the political problems over the last few months they naturally want political calm and economic recovery. I don’t think I’ve ever seen such a rich mix of archaeological and architectural treasures. Ephesus, the Hagia Sophia and the Blue Mosque were all extraordinary. As this blog is usually about climate Change and energy issues it’s only fitting that I give them a mention. We saw lots of rooftop solar water heating systems, but plenty of scope for more. We saw remarkably few photovoltaic panels, but these are apparently just starting to take off in Turkey, and in 2013 Turkey opened its first small concentrating solar power station. Carbon emissions in Turkey are 4.4 tonnes per capita, but as this a county with huge solar potential this figure could be rapidly and beneficially reduced, but for that to happen Turkey needs peace. Many Turks are currently looking to neighbouring Syria with a sense of fear and dread that all that chaos and bloodshed could only too easily spread to Turkey. We share their desire for peace, for a calm evolution of democracy and a revived economy, ideally powered by the sun, and accessible to us via sustainable flight! This entry was posted in Miscellaneous on 10 September 2016 by Richard.